Ballet West • Company to premiere ground-breaking ballet adaptation of a classic short story  with a surprise ending every night. Steve Griffin | The Salt Lake Tribune Nicolo Fonte, Ballet West's new resident choreographer, works with dancers, as they rehearse for the upcoming performance of "Bolero." The company was rehearsing at the Capitol Theatre in Salt Lake City, Utah Wednesday September 26, 2012. Choreographer Val Caniparoli. Courtesy photo Chris Detrick | The Salt Lake Tribune Members of Ballet West perform "Bolero" during a dress rehearsal at the Capitol Theatre Thursday November 1, 2012. Chris Detrick | The Salt Lake Tribune Demi-Soloist Emily Adams and principal artist Christopher Ruud of Ballet West perform 'The Lottery' during a dress rehearsal at the Capitol Theatre Thursday November 1, 2012. Chris Detrick | The Salt Lake Tribune Members of Ballet West perform 'Bolero' during a dress rehearsal at the Capitol Theatre Thursday November 1, 2012. Chris Detrick | The Salt Lake Tribune Principal Artist Christiana Bennett and soloist Easton Smith of Ballet West perform 'Bolero' during a dress rehearsal at the Capitol Theatre Thursday November 1, 2012. Chris Detrick | The Salt Lake Tribune Tyler Gum and other members of Ballet West perform 'The Lottery' during a dress rehearsal at the Capitol Theatre Thursday November 1, 2012. Chris Detrick | The Salt Lake Tribune Soloist Sayaka Ohtaki, demi-soloist Emily Adams, principal artist Christopher Ruud, artist Owen Gaj of Ballet West perform 'The Lottery' during a dress rehearsal at the Capitol Theatre Thursday November 1, 2012. None of the 14 dancers in Val Caniparoli&apos;s dance adaptation of "The Lottery" know who will perform the 8-minute closing solo each night until the ballet is almost over. Call it luck or misfortune, but the dancer who pulls the paper with the black dot from the box performs the solo. 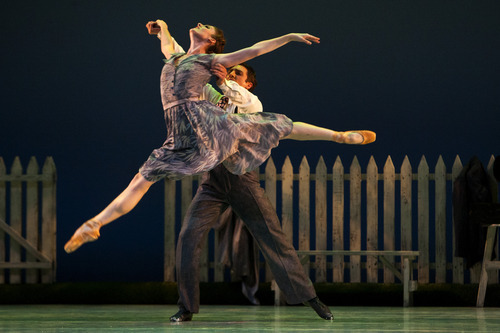 The ballet follows the plot of American author Shirley Jackson&apos;s short story that has been described as "a chilling tale of conformity gone mad." There&apos;s no explanation in the classic story as to why the residents of the small rural town agree to the annual ritual of a lottery that selects one person to be stoned. But "The Lottery" has become one of the most famous short stories in American history. Now it provides the plot for a ballet, which opens a world-premiere run at the Capitol Theatre on Friday, Nov. 2. "The project is crazy, it is really challenging, but the excitement and intensity onstage is amazing," Caniparoli said. "Some dancers are nervously hoping not to get picked; others want to do the solo. Ironically, the dancer with a sprained ankle [Sayaka Ohtaki] keeps drawing the lot." Caniparoli&apos;s work might be familiar to some longtime local ballet fans, as he was Ballet West&apos;s resident choreographer from 1994-97. For most of his career, he has been based at the San Francisco Ballet, where he began working more than 30 years ago under the directorship of Lew Christensen. 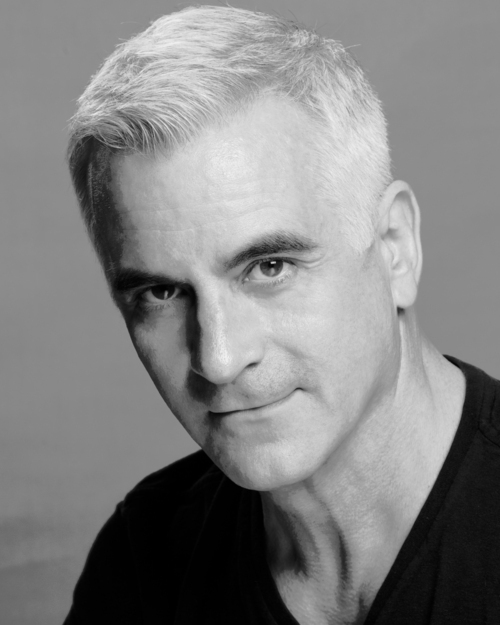 In the 1980s, Caniparoli was appointed the San Francisco company&apos;s resident choreographer. Caniparoli first majored in music "until music theory started looking like math, and I moved on to theater and English literature." He said his introduction to telling stories through dance is rooted in studying under Lew Christensen and his brother, Willam F. Christensen, who founded Ballet West in 1963. Both were influenced by their father&apos;s background in vaudeville. "I have wanted to make a ballet from Jackson&apos;s story for 15 years, but could never find the right music," Caniparoli said. "So when Adam [Sklute] offered to find funding for the score, both the Jackson Trust [which holds the rights to the writer&apos;s work] and I got very excited about moving on this project." 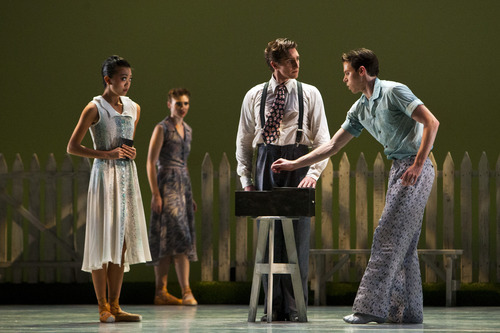 Sklute calls the choreographer&apos;s premise "absolutely brilliant." In the story, one character wins the lottery and tragedy ensues. "But in Val&apos;s ballet, all the dancers choose secret lots onstage. They and the audience find out at the same time who is to be the victim. And this can change from performance to performance. It&apos;s pure luck of the draw, and the tension onstage is real." 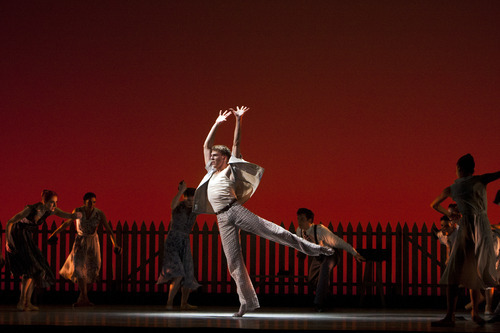 Caniparoli had worked with composer Robert Moran and wanted him to create the score for the ballet. "It&apos;s very tough to do a score," Caniparoli said. "The composer has to be in on everything from design to concept to the ending." Caniparoli built the story with a cinematic vision. He gave each dancer a backstory for his or her character and designed a minimalist set. "Not knowing who will dance the solo creates dramatic tension and a sense of excitement that would otherwise be hard to conjure up," he said. "I know I feel very nervous waiting to see who has chosen  it&apos;s a very emotional moment for everyone." P Ballet West launches its season with the world premiere of Val Caniparoli&apos;s ballet of "The Lottery," commissioned by Ballet West and based on Shirley Jackson&apos;s short story. Also on the program: the revivals of Nicolo Fonte&apos;s "Bolero," set to Maurice Ravel&apos;s music, and Helen Pickett&apos;s "But Never Doubt I Love," set to music by Felix Mendelssohn and Franz Liszt, commissioned by Ballet West in 2010. When • Nov. 2-3, 7-10, 7:30 p.m.; with a 2 p.m. matinee on Saturday, Nov. 10. Tickets • $19-$75, at 801-355-ARTS (801-355-2787) or http://www.balletwest.org.